Developing an effective interpretive experience requires careful planning and preparation, along with top-notch communication skills. Interpretive Basics: Module II teaches interpreters how to engage, inspire, and empower visitors by delivering enjoyable, memorable, and meaningful interpretive experiences. This module demonstrates the importance of purpose, message, and organization and explores the artistic side of interpretation, including development steps and creative delivery techniques. Participants explore body language, word choice, question-and-response, transitions, and the use of props and biofacts. They identify techniques for enhancing audience participation and even practice handling challenging visitor situations. The module takes participants through the important planning steps and critical elements that are an essential part of an effective and inspiring interpretive experience. Interactivity sprinkled throughout the module engages participants in the learning process, and questions at the end of each section ensure that they have mastered fundamental concepts before they move on. Docents, guides, and interpreters who have successfully completed Interpretation Basics: Module I know the principles of interpretation and the importance of understanding visitors. In Interpretation Basics: Module II, they can further develop their interpretive skills in a course that takes about an hour to complete, although participants progress at their own pace and may repeat the entire course or sections of the course as many times as they like. The two Interpretive Basics modules can be easily integrated into your current training program. Providing online modules that team members can complete anywhere and at any time overcomes one of the major challenges of training: getting all participants together in one place at one time. 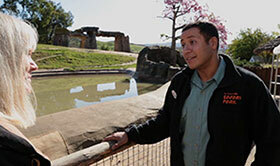 At the San Diego Zoo and Safari Park, participants complete the online modules on their own before attending group training programs. They are able to master key vocabulary and concepts, giving them a solid foundation that allows them—and their trainers—to make the most of in-class and on-site training. 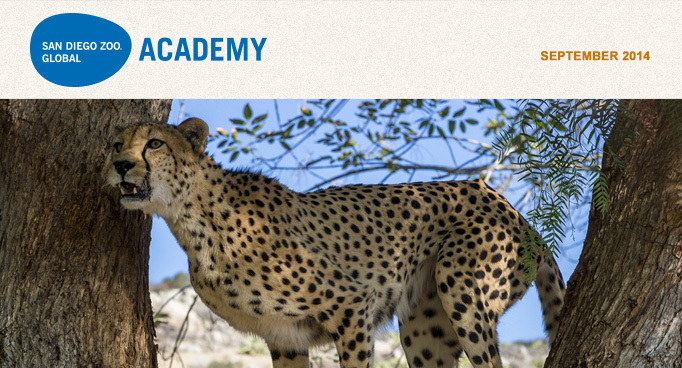 Keepers, interpreters, guides, and docents can dive into the fascinating world of cheetahs as the San Diego Zoo Global Academy presents Cheetahs, the newest module in Introducing Animals, our series about animal species and other taxonomic groups. 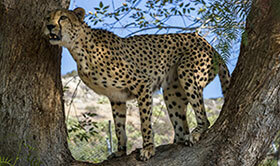 The module covers an overview of cheetah physical characteristics, distribution and habitat, behavior and ecology, and reproduction, as well as important conservation efforts dedicated to its protection. Remarkable images show cheetahs in ways you've never seen before, and video provides insights into their behavior. Interactivity sprinkled throughout the module engages participants in the learning process, and questions at the end of each section ensure that they have mastered fundamental concepts before they move on. The Cheetahs module takes about an hour to complete, although participants progress at their own pace and may repeat the entire course or sections of the course as many times as they like. The Cheetahs module joins Polar Bears, Giant Pandas, Tigers, and Gorillas in the Introducing Animals series. Look for modules about lions, apes, elephants, birds, and mammals, coming soon. These modules are an awesome resource for interpreters, but they offer insights to veteran animal keepers too, providing a glimpse of natural history that helps keepers address husbandry concerns. Whether you've worked with these animals for years or you're a brand-new interpreter or docent, these modules will equip you with a better understanding of these amazing animals. The San Diego Zoo Global Academy Will Have Booth #239 at the AZA Annual Conference in Orlando—Please Come By and See Us! We look forward to talking with you about all things Academy. One of those things can be the new capability for institutions to create their own content using the DIY Course Creator menu option. Please stop by and talk with us about this new tool that can be added to your custom Academy site. 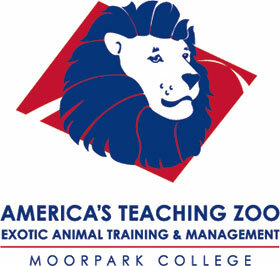 The Academy is very pleased to be working with Moorpark College and their program for Exotic Animal Training and Management. This program prepares students interested in working in the animal care industry. The Jenkinson's Aquarium in Point Pleasant Beach, New Jersey, joined the Academy's collaborative learning environment! Now they will have two privately branded customized sites, one for their employees and one for their volunteers. Welcome! CypherWorx, the San Diego Zoo Global Academy partner, will be presenting our third Administrators Users Group meeting. This is an opportunity for administrators of custom sites to discuss resources, share ideas, and ask questions. The agenda will include: Demo System Requirements; CypherWorx Support Hub; DIY Demo; and Site Maintenance Tips. If you are interested, we'd love to have you join us! This month we're adding a new section to this newsletter, the Academy's Idea Hatchery. We envision this as a virtual birthplace of creative online training ideas that all Academy participants can contribute to. The Academy's collaborative learning environment is already "hatching" innovative ideas; let's continue to make it even easier to share them! You get the idea—or, rather, you've GOT the ideas—let's collaborate on innovation. My Academy and The Volunteer Connection are the privately branded custom employee and volunteer sites at San Diego Zoo Global. Safety is such an important topic and the opportunities for online training are vast, so we now also share our use of the Academy resources for our safety training efforts. Do you want to create a custom report? There is a really great resource right at your fingertips. When you click on the reporting tab, choose the custom reports option in the top right corner. Next, click on "create a new report" option, and the final click is on the "how to create a custom report" tab (located in the center of the page) for a step-by-step guide on how to do just that..
Want to save yourself some scheduling headaches? Create groups by assignments and ask the volunteers to try to replace themselves if they need to miss an assignment. They can go to "announcements" within their group and put it out to their fellow volunteers that they are looking for someone to cover their shift or swap shifts. It also creates more of a team spirit among the volunteers who don't normally communicate with each other because they volunteer on different days. It starts them talking to each other and saves you time and coverage hassles. One of the features that I immediately became excited about in the Academy was the catalog of safety courses. I found almost 400 titles, most of which were deemed useful for the Zoo and Aquarium industry. There are many titles that are specific to construction, hospitality, and restaurants as well. Those titles are great for departments such as maintenance, guest services, and retail food establishments. At San Diego Zoo Global, we have gone through the entire catalog and reviewed each course to determine the length of every video. I will be formatting that resource and sharing it soon with all of you in the Academy. The other interesting tool we will develop using the safety catalog is a spreadsheet for each department. The spreadsheet will provide the department safety team a learning path, providing them the titles that are either required by regulatory agencies (such as OSHA), general topics of interest, or topics of emphasis that administrators feel are important for the groups to be trained in. We have departments that are using the resources already, but will be formally rolling out the new program later this month to all managers (more on that in a future issue).